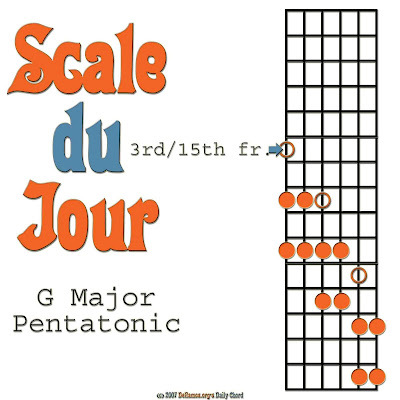 This is a very simple pattern to use when playing lead lines in the Key of G. Just follow the orange circles, and you'll be playing the G major pentatonic (penta = five, tonic = tones, or notes) scale in no time! You can enter the scale at any note, but if this is your first time, start off at the Low E string, behind the 3rd fret (where the blue arrow is pointing), or the 15th fret (one octave higher). That hollow circle, as well as the other hollow circles, represent the location of G notes in the pattern. The filled-in circles are the rest of the G major pentatonic scale: the A, B, D, and E notes. When you memorize this pattern, be sure to jam with someone else in the Key of G major. Among other chords, these chords are often used in the Key of G: G, C, and D. While someone plays rhythm, experiment playing lead guitar with the G major pentatonic scale!